Surfside is a beautiful oceanfront community in South Florida. It is a tranquil town that has perfect weather year round, many outdoor activities for residents to enjoy, beautiful homes and much more. Surfside is a unique community with streets named after famous writers like Dickens and Emerson. 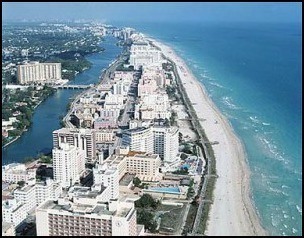 Surfside is only nine blocks long and is located near Miami Beach to the South and Bal Harbour to the North. The luxury homes and condominiums are perfect for couples or small families and parents don’t have to worry about their child’s education because the schools are some of the best in the area. Many businesses, roads, and other public areas have been renovated to match the luxury and elegance seen in the homes and condo buildings. Surfside also has a number of community programs for residents to take part in. There are many parks for families to enjoy, sponsored events to attend, and entertainment available to enjoy. The beach is also a large part of life in Surfside since it is a beach community. Surfside is close to all of the many attractions South Florida has to offer. Fine dining and shopping can be found close to Surfside. The Bal Harbour shops and the Aventura mall are both venues for fine dining and high end shopping. Surfside is near both major airports and major highways to get anywhere you need to go. Surfside is the quiet beachside community close to all of the entertainment and fun accessible in South Florida.